This trend is one that is not confined to weddings; you’ll see it everywhere – in restaurants and in private homes, as well. Quality food is more important these days than quantity, and the environment is a top priority. 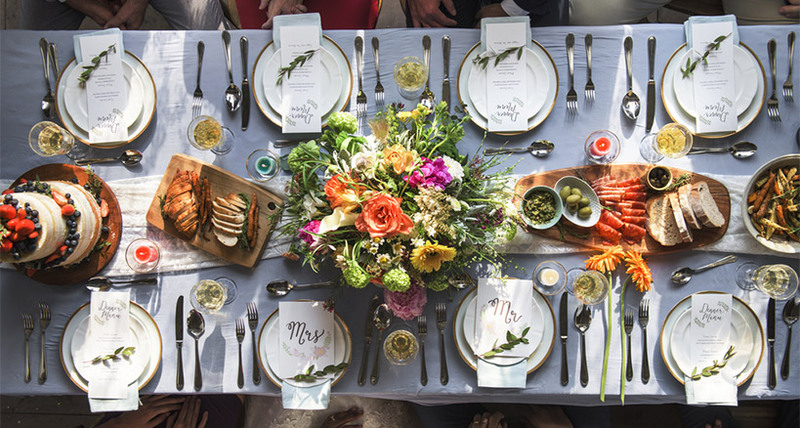 This trend is about to have a big impact on weddings, as more and more savvy couples are choosing to serve locally sourced, organic food that supports sustainable agriculture and local businesses. If you want to stay current and keep your customers – and the planet – happy, incorporate locally sourced items into your menu. As people are becoming more aware of sustainability and what it means for all of us, they are eager to support local businesses and use locally sourced products. In 2018, expect to hear requests for menus that connect guests with where their food came from. This often means more vegetable-centric dishes, as these days meat is considered a less sustainable option. High-end events and traditional weddings usually include waiter service for dinner; guests take their places (usually according to a seating plan) and the wait staff brings food to the tables, allowing the guests to relax and be served. However, the current trend is toward a more casual approach – and to giving guests more flexibility when it comes to choosing what to eat. 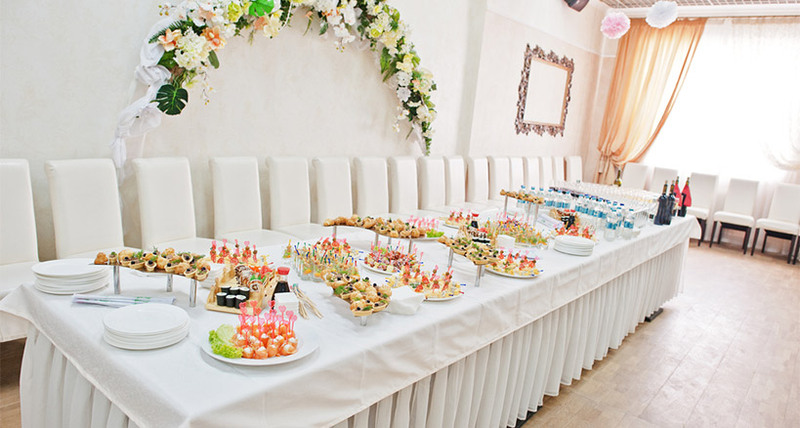 This means that buffets are gaining in popularity for the main meal, in addition to the reception. As casual usurps elegant, and buffets take the place of waiter service, the trend continues with the advent of brunch buffets that promote the “breakfast for dinner” concept. Brunches are huge right now – and there is no end in sight for this wildly popular trend – and many couples are choosing to adopt this trend for their wedding meal. For one thing, brunch has become fashionable because daytime weddings are less expensive than evening or afternoon events. 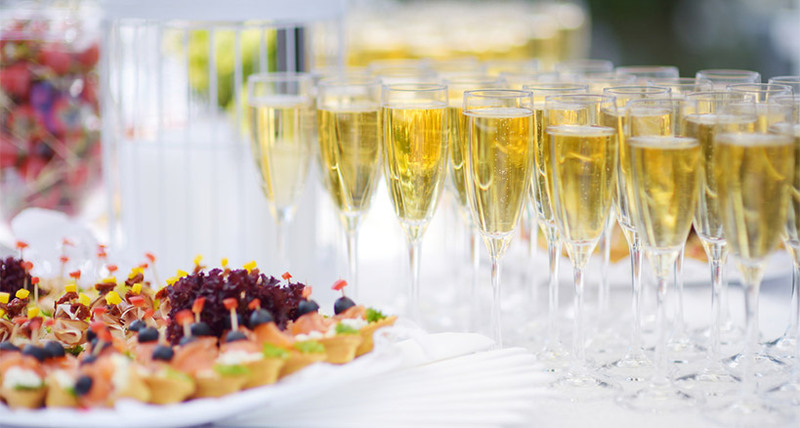 A brunch-themed wedding may offer drinks, such as mimosas and Bloody Mary’s, and traditional breakfast foods, such as omelets, waffles, and frittatas. Going one step further in the move away from staid and traditional toward casual and modern, many couples are finding that “comfort food” works at weddings just as it does at home. Nothing is more welcoming – even at a wedding or other upmarket event – than burgers, fried chicken, pizza, grilled cheese sandwiches, spaghetti and meatballs, mac and cheese, and other comfort foods that conjure warmth and good feelings (which is what wedding are all about, right?). Nonetheless, despite the seeming ordinariness of these comfort foods, caterers are being called on to find unique and creative ways to present these offerings that are more in keeping with a wedding venue than a McDonalds. Plants and vegetable-based dishes are finally getting the attention they deserve, and 2018 may very well be the year of the Wedding Veggie. There is a desire to put vegetables at the center of the wedding menu, if for no other reason than they add so much beautiful flavor, color, and texture to any meal. With the right ingredients and a skilled caterer at the helm, wedding guests might not even miss the meat. The idea is to be creative and bold with the vegetables and to present them in the least expected way. In addition, a feature in Vogue highlighted 2017 trends that we will see continuing into 2018. These include vegan foods, which might very well out-distance vegetarian offerings as this year’s top trend. Vegan options are surprisingly varied, and vegan weddings are part of a growing trend across society; in the United States, for instance, at least six percent of the population identifies as vegan – a huge increase from just a few years ago. As fewer people consume meat and dairy, we can expect to see a rise in vegan menus at weddings, and the smart caterer will take note ASAP. Gone – well almost – are the days of the wedding cake as the sole dessert after the wedding dinner. Instead, in 2018, we’ll be seeing the advent of mini desserts, a welcome trend. 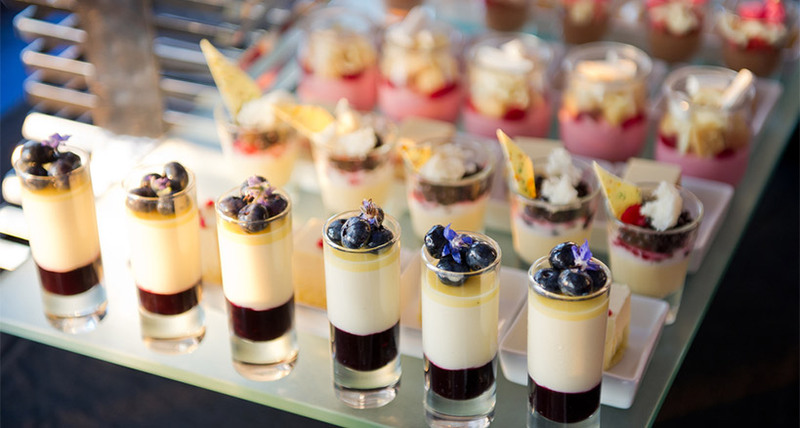 Combine this with the overall move to more down-to-earth options, and expect to see a dessert buffet that includes homier options like doughnuts, macaroons, ice cream, cheesecakes, pastries, cupcakes, and more. These delectable options add fun and excitement to a wedding meal. They may not be traditional – but they work in this day and age of less stringent wedding rules and requirements. Dessert can continue on into the night, as some couples want their guests to linger – and the dancing and fun can continue into the wee hours. That’s why late-night snacks are predicted to be a huge trend in 2018. Despite the full meal and luscious desserts, after an hour of dancing and celebrations, there might still be room for drinks and after-dinner snacks – small tidbits like cookies and other finger foods would fit in nicely here. Couples may want to emulate their own late-night at-home snack traditions, so you will very likely be called upon to prepare trays of fun foods, like pizza, tacos, or sliders. Although officially, weddings are all about celebrating the sanctity of love and marriage, food and drink often take center stage at this big event. With wedding trends showing that guests are more and more concerned with the food they are served, caterers must step up, and follow the trends in order to stay relevant. Young couples have Twitter and Instagram as sources for the latest trends – and so should you. Stay ahead of the pack by staying on top of wedding food trends for 2018.